My mom is diabetic, is she at risk for heart disease? My doctor says I'm overweight should I be concerned? My father died of heart disease at 46, what is my risk? My cholesterol is normal, am I at risk for heart disease? 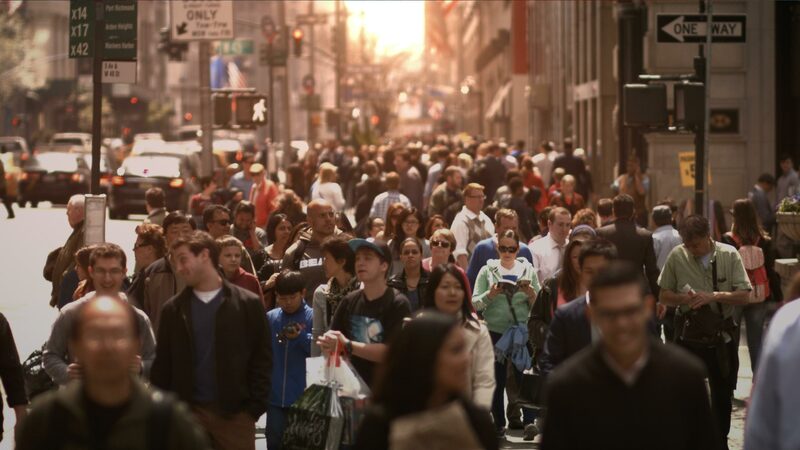 People die from heart disease in the U.S. each day. of patients who have a heart attack or stroke have normal cholesterol levels. We all want to age well, but far too many young Americans are having heart attacks or strokes and many are life-ending events. In fact, someone in the U.S. has a heart attack every 43 seconds. Heart disease and stroke are not only the leading causes of death but can make it impossible for some adults to return to work and enjoy their favorite activities. According to the Center for Disease Control, there are more people under age 65 who are dying from preventable heart disease and strokes than those who are older than 65 years. Once thought to be a “man’s disease”, heart attacks and strokes kill more women each year than the next four causes of death combined, including cancer. CLICK for 'The Science' on how a heart attack happens. The blood vessels that feed your heart muscle and brain are called arteries. These arteries carry blood that is the “fuel supply” you need for life. The arteries that feed the heart muscle are called coronary arteries and provide blood to the heart muscle so that it can pump blood. When cholesterol and inflammation build up within the walls of your coronary arteries, it’s called coronary artery disease. A heart attack can occur when a coronary artery becomes blocked and blood can no longer get through to feed the heart muscle. 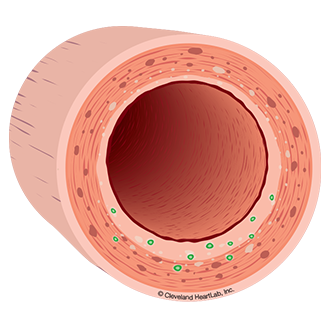 The blockage is caused by a buildup of cholesterol in the wall of the artery (plaque with a large lipid core) that becomes inflamed and then ruptures or breaks open causing a clot to form. It’s similar to having a sore or pimple on the inside of your artery wall. If there is a lot of cholesterol and inflammation in the plaque, the cap on the sore can become very thin and weak (unstable). If the thin cap is damaged and the inflamed sore breaks open, your body tries to repair the damage by forming a clot. The combination of the plaque and clot together can completely close off the coronary artery and cause a sudden heart attack or sudden death. If this process happens in an artery that brings the blood supply to your brain, a stroke can occur. The inner lining of your arteries are damaged by things like smoking, diabetes, high blood pressure, and poor lifestyle habits. This damage allows cholesterol in your blood to more easily enter the walls of your arteries, leading to disease. The cholesterol injures the inside of the artery wall and your body tries to get rid of it in the same way it does a splinter in your finger. As you know, the inflammation that forms around the splinter can cause a painful, red sore. 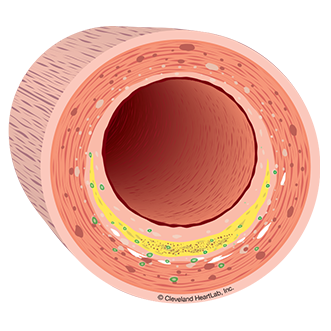 When cholesterol enters the wall of the artery, a sore forms inside the artery wall. When enough cholesterol accumulates, it may cause inflammation to the point it triggers a heart attack or stroke. Your doctor has probably tested your cholesterol levels to see if you are at a risk for a heart attack. If you have normal cholesterol levels you may assume you are not at risk for a heart attack or stroke. This is not always true. Approximately 50% of patients who experience a heart attack or stroke have normal cholesterol levels. So, what is driving these events to still happen? Researchers now understand that heart attacks and strokes happen because of inflammation in the artery. Measuring cholesterol without inflammation may only tell part of the story. Cholesterol testing provides part of the picture. Inflammation testing helps provide a more complete picture of YOUR RISK for heart disease. Cleveland HeartLab’s inflammation tests can help YOU and your doctor have a better understanding of YOUR RISK of heart attack or stroke. Watch the Know Your Risk Video™ to learn more about how simple blood and urine tests help doctors assess inflammation so they have a more complete picture of your individual risk for a heart attack and stroke. Understand how doctors identify which patient is at risk based on inflammation test results. Cleveland HeartLab offers simple blood and urine testing that provides you and your doctor information that may be used to help evaluate your risk for heart disease. These tests can be used alongside cholesterol testing to provide a more complete picture of YOUR RISK for heart disease. F2-Isoprostanes (F2-IsoPs) is a ‘lifestyle marker’ that measures the amount of oxidation in your body that may damage your endothelium. Eating too much red meat, smoking or not exercising enough can increase your F2-Isoprostanes levels and increase your risk for future heart disease. Oxidized LDL (OxLDL) is a marker that measures the amount of LDL – or “bad cholesterol”- that has been damage due to oxidation. Poor lifestyle habits can increase your OxLDL levels and increase your risk for pre-diabetes. Your arteries are protected by a thin layer of cells (endothelium) which act like the shingles on a roof and prevent cholesterol from getting into the artery wall. The endothelium can be injured, or damaged, by various risk factors including uncontrolled blood pressure, uncontrolled diabetes, a poor diet consisting mostly of sugars and red meat, and inflammation. ADMA/SDMA and Microalbumin are markers of endothelial damage. ADMA/SDMA identifies endothelial damage due to the loss of nitric oxide, a molecule that can protect the endothelium. Microalbumin identifies endothelial damage in the kidneys. Increased levels of these markers may identify the presence of diabetes or heart disease. hsCRP is a general marker of inflammation. The presence of a cold may increase hsCRP levels over the short-term (days to weeks). However, the accumulation of cholesterol in the artery wall many result in increased hsCRP levels over the long-term (years to decades). Cholesterol that continues to make its way into the artery wall can lead to inflammation. The body sends in specialized immune cells called macrophages to remove the cholesterol. Macrophages eat the cholesterol and instead of removing it, they turn into “foam cells” – a name given to cholesterol filled macrophages due to their foamy appearance. The foam cells then get trapped in the artery wall and this causes the body to send in more macrophages. The process becomes a vicious cycle that leads to the formation of an inflamed sore on the inside of your artery wall which may lead to a blockage in the artery if the disease process is not discovered and treated. Lp-PLA2 is a marker that measures the active build-up of cholesterol inside your artery walls. Your risk for a heart attack increases as Lp-PLA2 levels increase. Myeloperoxidase (MPO) is a marker that measures the body’s response to a damaged endothelium that has become thinned, cracked and ultimately unstable due to cholesterol accumulation and inflammation. Your risk for a heart attack increases as your MPO levels increase. Too much cholesterol build-up and inflammation can cause the endothelium to become thin, unstable, and at risk for rupturing. When it ruptures, the contents of the artery wall are released into the bloodstream which triggers a blood clot. The blood clot can cause a heart attack or stroke. Information about the inflammation test for F2-Isoprostanes (F2-IsoPs). Click to download a PDF file of the handout. Information about the inflammation test for Microalbumin. Information about the inflammation test for ADMA/SDMA. Information about the inflammation test for Myeloperoxidase (MPO). Information about Inflammation Testing from Cleveland HeartLab. Often the first symptom of heart disease is a heart attack. Ultrasound and imaging tests help doctors identify patients at risk for a heart attack but they cannot be done everywhere and are too expensive to be done on everyone. Fortunately there are new blood and urine tests that are easy to do in your doctor’s office. These simple tests can help you and your doctor know your risk for a heart attack or stroke. When you KNOW YOUR RISK of a heart attack or stroke, you can work with your doctor to REDUCE YOUR RISK. Gender – Men are at higher risk if over 45 years of age and women if over 55 years of age. Family History – Your risk is higher if members of your family have had cardiovascular disease (heart attack, bypass surgery, a stent, or stroke) at a young age; before age 55 years for men or before age 65 years for women. High Blood Pressure – Know your blood pressure. Ideally it should be less than 120/80 mm Hg when you are at rest, although somewhat higher levels are often OK with your doctor when you’re older. High Blood Cholesterol – Your risk for heart attack is lower if your LDL-cholesterol is less than 100 mg/dL and your non-HDL-cholesterol is less than 130 mg/dL. Physical Inactivity – Sitting for long periods of time increases your risk. Even moving around for 5-10 minute periods throughout the day can lower heart attack risk. Obesity and Overweight – Risk for disease is related to those extra pounds around your waist line. Losing 5-10% of your body weight reduces health risk. Smoking – Research has shown that every 5 cigarettes a day smoked increases heart attack risk. Quitting smoking reduces heart attack risk immediately. Diabetes – It is very important to KNOW your blood sugar level. Normal blood sugar levels are under 100 mg/dL. What can I do to help lower my F2-IsoProstane levels? You can make changes in your daily life which can lower your F2-IsoPs to safe levels. Reducing the amount of red meat and increasing the amount of fruit and vegetables you eat can help lower your F2-IsoPs levels. Adding one fish meal a week as part of a low-fat diet may also lower F2-IsoPs levels. If you smoke, quitting will lower your F2-IsoPs levels. What can I do to help lower my oxidized LDL levels? Increase your amount of physical activity. What can I do to help lower my hsCRP levels? Lifestyle changes, such as exercising more, eating more heart-healthy high fiber foods such as fruits/vegetables and whole grains or following a Mediterranean diet. Quitting smoking helps reduce the amount of general inflammation in your body. Taking good care of your teeth can also help lower hsCRP and reduce your risk of heart disease. There are prescription and nonprescription medications that also can help lower hsCRP. What can I do to help lower my microalbumin levels? Two major factors that contribute to high microalbumin levels are high blood pressure and high blood sugar levels. Therefore, it is important that you work with your medical provider to develop a plan to lower these. Lifestyle changes, including increasing the amount of fruits, vegetables, and whole grain products and reducing the amount of salty or sugary foods you eat may help to reduce your blood pressure and blood sugar. Exercising regularly can also help you regulate your blood pressure and blood sugar. There are medications which your medical provider can prescribe if lifestyle changes are not working for you. What can I do to help lower my MPO levels? There are a number of things you can do to lower your overall risk of heart disease, as well as lowering your MPO levels. It is important to maintain a healthy blood pressure because high blood pressure may damage the vessel wall and begin plaque formation. A heart-healthy diet is also recommended, as research has shown that weight loss helps decrease inflammation. There are prescription and nonprescription medicines your medical provider can give you that reduce MPO levels. What can I do to help lower my Lp-PLA2 levels? There are a number of things you can do to lower your overall risk of heart disease, as well as lowering your Lp-PLA2 levels. Exercise can also help to reduce your Lp-PLA2 levels. See your dentist. Periodontal disease may elevate Lp-PLA2. There are prescription and nonprescription medicines, as well as supplements, your medical provider can give you that reduce Lp-PLA2 levels.